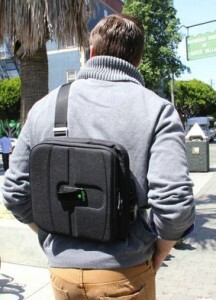 Carrying your things along with your iPad becomes much easier with the Trego Wearable iPad Case. The Trego Wearable iPad Case is specially structured to fit tablets from iPad2 onwards. It protects it from the elements while doubling as a handy work station. The wearable case is made of tough and durable nylon with aluminum D-rings. It has industrial-grade zippers to ensure longevity and strength. It likewise easily slings over your shoulder via an adjustable strap, making your hands available for carrying lighter and more compact things.